JLL Singapore, launch to market a freehold Good Class Bungalow on prestigious Dalvey Road. 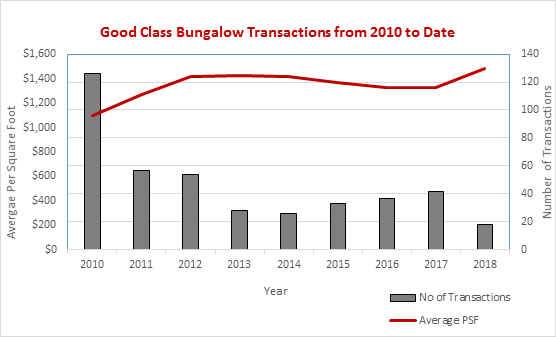 Good Class Bungalow transactions from 2010 to date. Sole marketing agent, JLL, has launched a plum 51,058 sqft Good Class Bungalow (GCB) at the prestigious Dalvey Road (the “Property”) for sale by tender. The freehold bungalow, No. 81 Dalvey Road, is located within White House Park GCB Area – one of the most sought-after among the 39 gazetted GCB Areas in Singapore. Built in 1967, the existing two-storey bungalow sits on elevated grounds at one of the highest points in the locale, and possesses commanding views of the lush surroundings, with the UNESCO World Heritage Site, Singapore Botanic Gardens within a mere 700-metre walk. Last month, a newly-completed GCB at Jervois Hill was sold at $2,730 per sqft, recording the highest unit land rate in GCB transactions. GCBs, at the apex of the housing forms, are safeguarded by the Urban Redevelopment Authority (URA) with stringent planning rules and guidelines ranging from a stipulated minimum plot size, site coverage to building height restrictions etc. to preserve the unique and exclusive form of housing for the locals. Under the current guidelines, the Property may be subdivided into three GCB plots. This may appeal to developers and investors looking to develop top-notch homes in a prime GCBA. GCBs are often sought after for their coveted address, prestige, exclusivity and wealth preservation quality. They remain an asset class that is resilient as seen from prices of GCBs which stayed relatively stable throughout the last global financial crisis and the introduction of residential market cooling measures. Additional Buyer’s Stamp Duty (ABSD) was first introduced in December 2011 and revised upwards in January 2013, and again in July 2018. These measures, although suppressed the number of GCB transactions, did not incur any profound effects on the average unit land prices achieved over these years. While prices continued to consolidate slightly from 2013, they have seen a turnaround again this year with expected momentum going forward, as shown in the table below. The tender will close on 12 September 2018, at 2.30pm. For more information about the Good Class Bungalow on Dalvey Road, email Tan Hong Boon, Regional Director of JLL Singapore, via the contact details listed below.